NHL's Stanley Cup Playoffs Open Tonight : The Two-Way The Chicago Blackhawks welcome the Boston Bruins for Game 1 in Chicago. 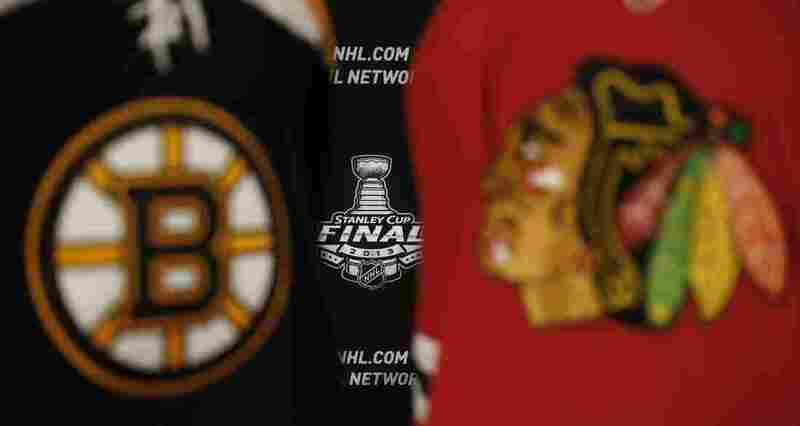 The 2013 NHL Stanley Cup logo is seen between the sweaters of the Boston Bruins and Chicago Blackhawks. The Game 1 puck drops at 8 p.m. Wednesday in Chicago. Yes, the NBA finals are well underway, and yes it's mid-June, but tonight marks Game 1 of the National Hockey League's Stanley Cup championship. A strike-shortened season pushed the finals later into the spring than usual. "This edition of thrill theater went so long that maintenance crews were arriving for their lobster shift to sanitize the building — no easy task when it's full of people screaming," says Bob Verdi, the Hawks' team historian. That game lasted about four hours and wasn't settled until the second overtime, when Hawks' talented right winger Patrick Kane scored his final goal (a hat trick), sealing Chicago's victory, 4-3. Chicago has a lot of momentum going — including winning this year's President's Trophy, a recognition of the fact the team had the best record in the 2013 season — so there's hope in the Windy City that this will translate into an NHL championship, notes the Chicago Tribune (subscription required). But a lot of eyes are on Boston, and especially on the skill of the Bruins' goaltender, Tuukka Rask. As NHL.com puts it, "in stopping 134 of the 136 shots he faced in the Eastern Conference final against the Pittsburgh Penguins, Rask became just the third goaltender to give up two goals or fewer and win all four games in a playoff series." That's right — in the four game series played between Boston and Pittsburgh, the Penguins scored only two goals. Rask had shutouts in two of those games — and as The Associated Press notes, Pittsburgh was the highest scoring team in the league this year. Boston even held formidable Penguin stars Sidney Crosby and Evgeni Malkin to zero goals in the series. That's also thanks to top Bruins defenseman Zdeno Chara. Adam Gretz of CBSSports.com says Chicago will overcome, because it will push a better defense against Boston than Pittsburgh did: "And isn't likely to have a complete meltdown like the Penguins did in Games 1 and 2 of the Eastern Conference finals." Ah, but his CBS colleague Brian Stubits says Boston will win because it has Rask, Chara — and an incredible offense. They're "generating more shots right now than any team in the postseason," he says. "In total, in their last nine games, the Bruins have outscored opponents 28-12." The puck drops at 8 p.m. ET. You can watch on NBC TV and online at NBC Sports Live Extra.